Are you ready to welcome the arrival of the year of the Metal Tiger? This combined sign signifies both the energy to begin activity and the determination to follow it through to the end. Events set in motion now will pick up speed and continue until either the objective is attained or the whole endeavor crashes and burns. I'm not a very superstitious person myself but I respect any beliefs that wouldn't require me to give up an arm just to be lucky. So what does the Metal Tiger have in store for us this year? Bold, cold Metal rules in contrast to last year’s pragmatic, calculating Earth. This difference will be all the more dramatic as 2010 is a dynamic, Yang year. Metal’s Yang aspect is extremely aggressive and does not tolerate opposition. The combination of Metal and Tiger is not, however, a totally negative one. Together they represent the kind of force necessary to accomplish the most difficult tasks. The impossible just might be possible during this exciting time. I’m already getting excited in achieving my plans this year! Things that have needed to get done but were not due to some blockage will be done or at least see significant progress being made. On the other hand, some that probably should never even have been attempted will also go to completion. This is because the Metal Tiger is associated with a lemming mentality. The point is now is the time to attack the most difficult issues you face. You have one of your best chances of achieving a breakthrough. On the other hand, if you still run into stiff opposition, you would do well to consider postponing your attempt to another time. You see, the same force that propels you forward is also with those opposing your efforts. The only thing we can say for sure is the year 2010 will be a tumultuous one. This is true for individuals, societies and the human race in general. It’s perhaps a better time for knocking down walls than building them. Be careful in whatever it is that you do that's the main theme for this year's predictions. Who knows maybe with the type of person you are you might already be doing it. Like with all predictions of any sort, this should only serve as a guide and not a solid rule to live our lives by. Let's not go overboard and be all paranoid and stuff. Just be careful and mindful of what you want to do and I guess everything will be okay. As I said, let's not give out an arm just to make sure we get good luck. And yeah the year of the Metal Tiger officially starts on February 14th so there's still a lot of time to practice. People who thirst for adventure and can reign in their emotions could experience a thrilling and rewarding year. Yes, being a Fire Rabbit I am already excited to unleash my Dying Will Flames rawr!!! 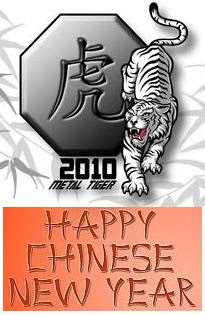 Happy Chinese New Year to all and welcome the year of the Metal Tiger!